Black and white negative of a photograph of a postcard of the post office at Port Whitby. The man standing in front of the building is Castle Fox, a shoemaker who lived in the house before it became a post office. This house has since been demolished. This brick house was located on the east side of Brock Street (1615 Brock Street South), north of Watson Street. 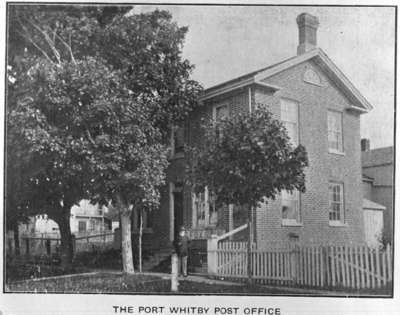 From 1894-1913, it was the post office for Port Whitby, after which the post office moved to the Goldring Store. Port Whitby Post Office, 1905, unknown photographer, Whitby Archives, 11-001-027.